By now the new page is up. It is still a work in progress. I want to re-theme the blog, and add some details like a logo and favicon. I also need to fix some posts for style, broken links, and insert the missing photos. However, the content should all be there. It’s just one of the projects I’ve been working on here at the bottle farm. 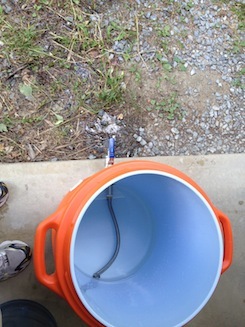 I’ve made a little progress on the keggerator project, Here’s a photo of that progress. 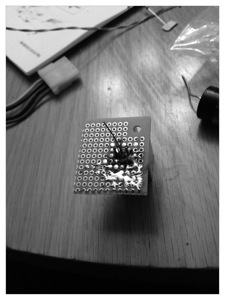 I converted the single regulator to a dual regulator. 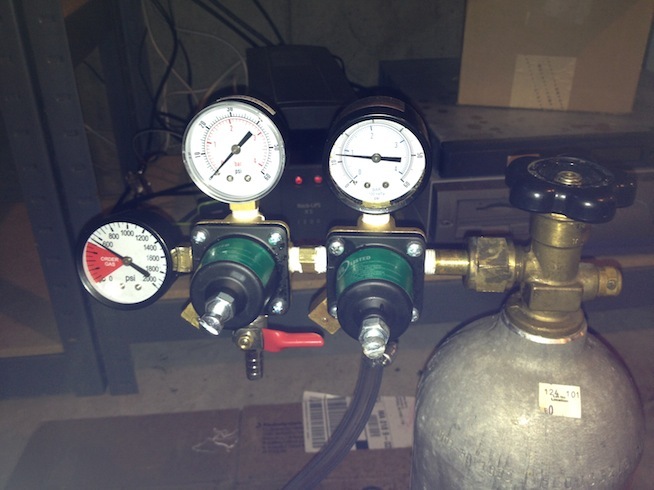 This will allow me to carbonate at one pressure, and serve at another. The plan is to keep the co2 tank outside of the freezer, and run the second line into freezer to a distribution block. To convert the regulator it’s very straight forward. Unscrew the high pressure gauge (be careful to do so in the proper direction), attach the second regulator to newly vacant spot, then replace the gauge on the second regulator. The only tricky part is finding the right parts, but thankfully Midwest supply carries the adapter http://www.midwestsupplies.com/double-regulator-adapter.html and the connection stem. A few tips I picked up for co2 assembly. 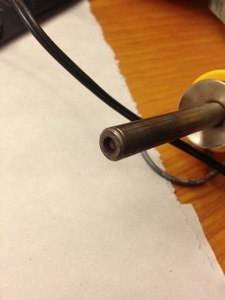 Make sure to wrap the threads with teflon tape to prevent leaks and gauging from over tightening. Spray down all the connections with starsan after you’ve reconnected the regulators and gauges to the co2 tank. Any leaks will bubble preventing you from finding out the hard way with an empty tank and flat beer. After I retightened the gauge and regulator resolving some of my own bubbling issues, my new dual regulator is all set for keggerator duty. This is a multiphase project, the next phase is design the collar. The collar in my keggerator serves a dual purpose, to extend the height of the freezer to allow for additional kegs in the freezer, and it’s traditional role to allow taps to be added to the freezer w/out drilling. Once designed and built, all that will be left will be staining and assembly. I can really see this project taking shape. The next project I’ve been working is a mash tun for all grain brewing. The hop plants seem to be doing ok, of the 5 mounds, 8 plants I’ve planted, 4 are growing. The Cascade, and Hallertau are well established, and seem to be climbing well. They haven’t reached the top yet, which I’m surprised. It has me thinking I might want to use some different twine next year, and perhaps a more vertical trellis. The galena have seem to taken hold and are at the training to climb phase. The centennial are off to a very slow start, but have finally started to show some growth. I’m hoping both the later have a chance to grow some solid roots for next season. That’s the good, the bad is that we seem to have some hop pests (the little guy to the right). 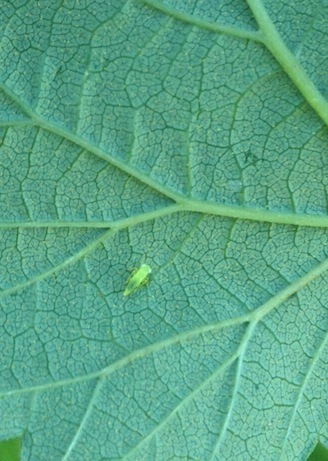 I think he’s a leaf hopper. I’ve asked my local farmer if she has any recommendations for organic pest control, so I can save my hops. Hopefully it’s something simple. I’ve also got a set of components to build a stir plate, but I haven’t made progress on this project yet. It should be easy enough, soldier the parts, build out a project box. However I’ve never done these types of projects, so there is a bit of a learning curve to it. 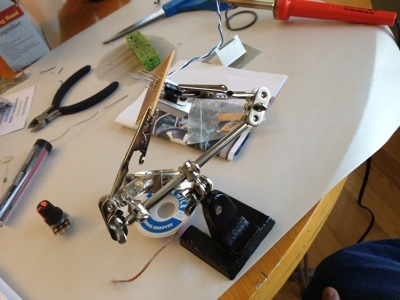 The next step is to buy some soldier, a project box and a power supply, and get to assembling. Other than that it’s quiet here on the farm.